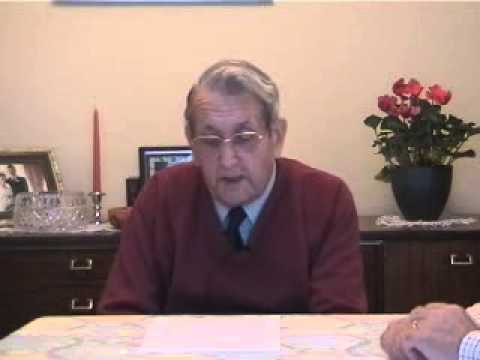 Ray Clifton was born in Olney in 1927 and lived in the town all his life. He died in January 2015. From quite an early age I took an interest in trees generally and then in oak trees in particular. The use of oak trees by the Royal Navy for the building of early ships is, of course, well known. I have for many years been interested in the early history of Olney including the fact that the poet William Cowper lived here. I read about the poet’s fondness of writing under an oak tree located near Kilwick Wood in Yardley Chase. This was later known as Cowper’s Oak and the area must have inspired his work. In January 1800, Cowper’s barber, a Mr Wilson, planted a seedling of the original Cowper’s oak in the Sutcliff Baptist Churchyard. (Mr Wilson lived in the house which is now Olney Delicatessen.) Gradually, I formed the desire to perpetuate the line of Cowper’s Oak. My children were aware of my plans and in particular, my younger daughter Elizabeth became really interested and started to help me in my quest. In 1973 she attended Sutcliff Baptist Church Sunday School. While I was wondering how I could achieve my goal of propagating Cowper’s Oak, she came home from a church bazaar with a flower pot containing a tiny seedling from the Baptist Church oak tree. You can imagine how pleased I was! I planted it in the garden of 43 Midland Road, Olney. 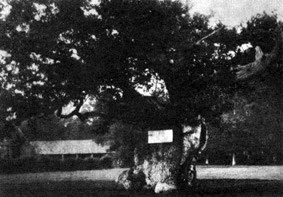 Over the next few years the seedling oak grew slowly into a sapling and in 1980 it had reached a height of about six feet. I thought that the best place for it would be in the garden of the Cowper and Newton Museum. In early 1983 I approached Mr Gordon Osborn, one of the trustees of the Museum, to suggest to the other trustees my offer to transplant the oak into the Museum garden. This way I would achieve my plan for the succession of Cowper’s Oak. Unfortunately, the trustees had to refuse my offer on the basis that the Museum garden was deemed too small to accommodate what would eventually become a large tree. 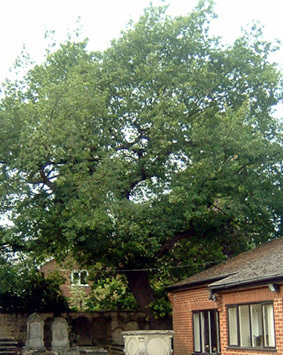 Although disappointed, I then offered my oak tree to Olney Town Council. They were pleased to accept my offer and the sapling was transplanted into Cherry Orchard in the autumn of 1983 by Ted Kitchener and Ron Simpson, the then Council grounds men. My story moves on. For two or three years the oak seemed to establish itself, but after one winter there was no sign of life just when it should have been coming into leaf and it had obviously died. However, I was now determined to have an oak tree in Cherry Orchard and. the next time the Council purchased a variety of saplings, I paid for a further oak to be bought and planted in the Orchard. Again, sadly, this tree lasted for just two years, and then it died. Still, I was not to be thwarted in my ambition, so I tried another approach. In the 1970’s and ’80’s I worked for Hoechst (UK) Ltd based in Milton Keynes. A ‘Victoria Jubilee’ oak stood on the edge of the company site and in 1983 I collected some of the acorns. These I planted in my back garden. Two of the acorns grew and eventually became some six feet tall. I again approached the Town Council and was given permission for their transfer, relocating them in Cherry Orchard. On November 29th 1996 two Council employees, Brian Wrighting and his assistant, re-planted the trees. Some eight years on, both trees have grown in height and stature and are a delight to my family and myself. At the time of writing, October 2004, they are obviously thriving. Although Ray did not achieve his original aim, the more than 200 year old ‘Son of Cowper’s Oak’ is alive and well in the Baptist Churchyard. Consequently it is even now possible to continue the line of the original Cowper’s Oak tree. Could someone just be interested enough to undertake Ray’s original quest and grow a direct descendent from the original Cowper’s Oak?